So far, Spring is off to a strong start! We successfully concluded our two-part parenting class; The 5 E's of parenting with Tender Steps of New York. Thank you to all the parents that attended. There was great learning and sharing of best practices for helping our families feel connected and encouraged while doing their best to raise their children. It is not always easy but we are here to help you. Congratulations to our raffle winners who went home with some great prizes! A shout out to our own Nyack Basics Director, Lynette Marshall who so graciously took over childcare for the event. On Sunday, March 24th Liberty families enjoyed delicious authentic Mexican cuisine from El Cunao on Main Street in Nyack. The res taurant is owned and operated by Alma Pena and Guillermo Zayas , one of Liberty families. If you have not tried El Cunao yet, I strongly encourage you to go. Enjoy!! Parent Teacher Conferences are soon approaching and we encourage everyone to make sure to take the time to visit with your child's teacher. If anyone needs any help scheduling the appointment or needs an alternative time, please let me know. Maybe I can help. If you need Summer Camp Information, do not hesitate to reach out to me and I will send home my extensive lists of options! Finally, below is a link for a new, free program at NAMI that addresses mental health concerns. The FIVE "E's" - Empower, Exposure, Experiment, Exclusivity and Execution will help you improve your parenting skills & share and learn with other parents. Free pizza dinner, childcare and raffles!! Thank you to all our Community Guest Readers who took time out of their busy schedules to read to our Liberty Classes. Here's a beautiful photo of Lynette Marshall, Director of the Nyack Basics Program reading to Mrs. Skrypack's 2nd grade class! Happy New Year and Happy Winter!! Our local libraries are a great place with many new programs for children and adults alike. I have resources for several excellent therapists and counselors in the area. Please call if you need a reference. Lunch payment: The link for MyPaymentsPlan is now located under For Families on the top bar of the school website. You can find information/flyers at https://app.peachjar.com/flyers/all/schools/119370 and the Liberty PTA Facebook page. If I can help you with anything, please call, send an email sjfalcomer@nyackschools.org or stop by!! My favorite parenting quote: Kids don't do what you say they do what you do. Thank you to all our wonderful families, students and staff who participated to make this year's Multicultural Festival the best yet! It is an incredible event that embraces our community's diversity and genuine compassion for one another!! When we break bread together, we begin to understand each other. Thank you to Liberty's awesome PTA for creating and organizing the event!! I would like to extend a warm welcome to all our returning and new incoming Liberty families and students! I hope you've had some time to connect, relax and rejuvenate. The Family Resource Center is here for all families! I welcome all your questions and concerns and am available to meet with you in my office Mon-Thurs 9-2. The Nyack School District FRCs in conjunction with Tender Steps of New York are presenting a series of (4) Parenting Classes. Please join us! Sessions begin promptly at 6:30 at The Nyack Center. Childcare and pizza dinner provided. FREE of charge. Hopefully everyone is staying warm and healthy. We always have extra warm clothes, coats, gloves and hats for anyone who needs them. There is a new urgent care clinic in Nyack at 89 N Highland Ave 845-770-9990; HRHCare. The Nyack Farmers Market is open to the public indoors at the Nyack Center; Thursday mornings 8:00am-2:00pm with fresh fruits and vegetables, fish and specialty items all winter long. The Family Resource Center has great options for after school programs, art classes, sports programs and of course summer camps. Keep an eye out for information about our March Parenting Classes coming soon, Monday evenings at The Nyack Center. 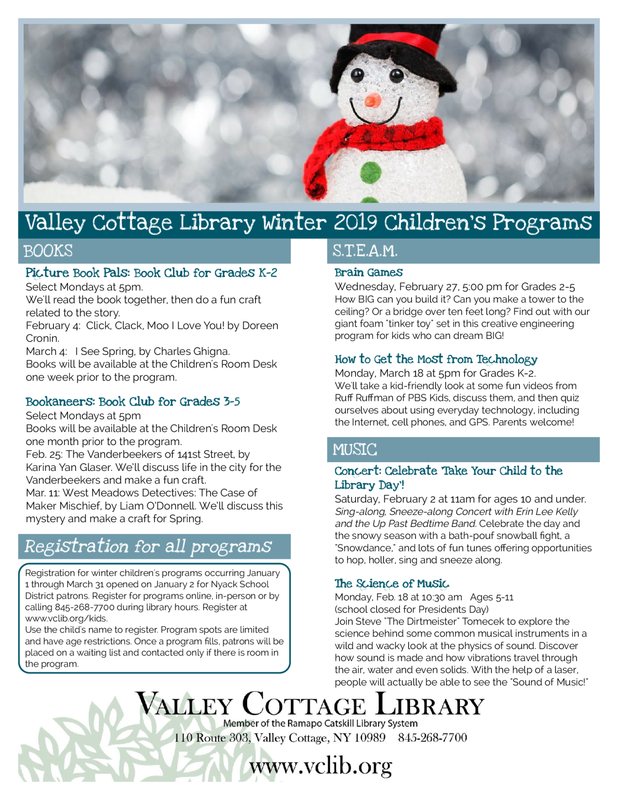 Attached is the February newsletter. Hello Everyone! November is here! Attached pleases find the November newsletter. Please join us next Wednesday evening, November 8th at 7:00 pm for Liberty's Multicultural Night!! It promises to be a great evening! with over 25 cultures being represented by our school families and staff. It's an opportunity to meet School Principals, School Leaders, FRC Coordinators and other District Families. The flyer is attached and posted on Peachjar. Attached is our October Newsletter. It's hard to believe we are already into our second month of the new 2017-2018 school year. Is it just me or do the days flyer by faster each year? The Family Resource Center is busy connecting with students and parents and welcoming our new families. Please know I am here to support all of you!! Family Resource Centers provide a safe place to ask questions, learn about school and community resources , share concerns and help you feel connected to our school community. I work very closely with our teachers, school support staff, bilingual teachers and our Principal and PTA. I sit on the PBIS and Sunshine Committees and attend our monthly PTA meetings. We are always working hard to bring more programs, events and learning opportunities to our school community. In addition, we work to create a safe, inspiring and positive school environment for students, staff and families. See attachment below for more info on after school programs. Please feel free to call the Family Resource Center if you have any questions, concerns or would like community resource information. Parental involvement in school has been shown to be an important factor in academic success. The Liberty Elementary School offers many programs and services for children and families. We invite you to stop in anytime. All Family Resource Center Programs and Services are free to Nyack School District families. This project is aimed at matching specific needs anonymously. The way it works is this: when the Family Resource Center hears about a child or family needing anything, it will send out an email to all parents who have volunteered to be on this list. Whoever has the needed item, will hit “reply all” and let everyone know that they’ve got it covered and bring in the item to the Center. El objeto de este proyecto es para ayudar las familias con necesidades específicas - de una forma anónima. La forma en que funciona es así: cuando el centro de recursos de la familia oye acerca de un niño o una familia que necesitan de algo, se envía un mensaje de correo electrónico a todos los padres que han ofrecido estar en la lista. Quien tiene el elemento necesario, golpea "responder a todos" y así todos saben que estar solucionado. Providing resources, referrals and information. Through Donation Station for needed items. Translation services on a daily basis supporting families, during parent meetings and parent-teacher conferences for social histories and at CSE meetings. After school and camp information. Providing scholarships for a wide variety of programs. Daily support for students through lunch time drop ins. Maintaining a free book cart. Programs to support socio-emotional development including Girls and Boys Circles. Kinderprep & support/translation for Kindergarten Screening and Kindergarten Orientation.